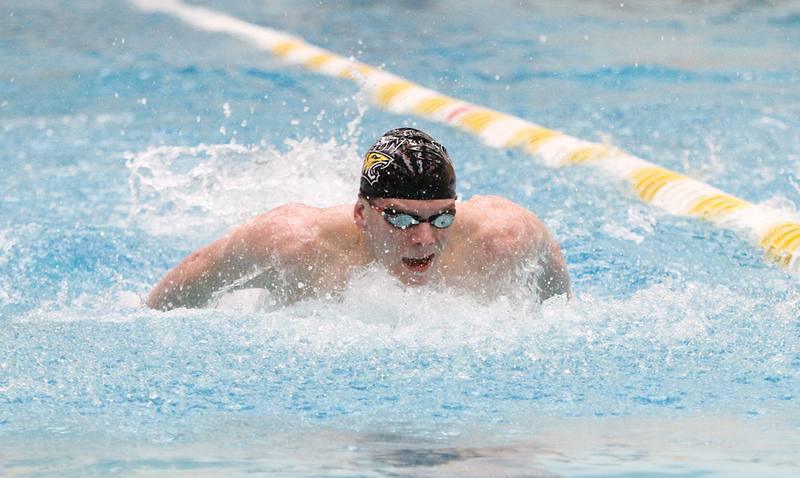 Towson won three events at the Bison Invitational, a meet that featured nine teams, held in Lewisburg, Pennsylvania on Saturday. The victories came from junior Matt Hans in the men’s 200-yard freestyle, sophomore Ryan Martin in the men’s 400-yard individual medley and senior Liz Saint in the women’s 1650-yard freestyle. Hans added second-and third-place finishes in the 100-yard backstroke and 200-yard individual medley, respectively, and was a part of the 200-yard freestyle relay team that took second in that event. The other notable swims for the men came from freshman Colin Roddy, taking second place in both the men’s 200-yard and 500-yard freestyle. In addition to Saint, the standout for the women was sophomore Olivia Evans, who, like Roddy, had two second-place finishes of her own. Her finishes came in the 200-yard butterfly and the 400-yard individual medley. The lady Tigers added a nice showing on the diving boards over the weekend as senior Lyndsey Dickson placed second and junior Natalee Szopo placed fourth in the one-meter event. In the three-meter dive, Szopo took third and Dickson came in fourth, with junior Molly Arceri adding a fifth-place finish. Freshman Jessica Ranjbar gave a third-place swim in the 200-yard breaststroke. And fourth-place finishes were had by junior Seana Acker in the 400-yard individual medley, senior Casey Edwards in the 200-yard butterfly and freshman Caitlin Manthe in the 200-yard freestyle. Sophomore Melissa Toy rounded out the top-five finishes, taking fifth-place in the 500-yard freestyle. As happy as Mead is with how the swimmers performed over the weekend, he said he still believes their best is yet to come. The Tigers will turn their focus to Blacksburg, Virginia and the Virginia Tech Invitational. The meet is set to start on Feb. 7 and run through the weekend.